To delve some more into the history of this fascinating town, head to the Lindwurm Museum, and get a glimpse into the life of the 19th century as well as bourgeois agriculture and home décor. Follow the wooden footbridge to the island Werd in the middle of the river, a popular green spot and attraction where Franciscan monks have set up their residence. Watching over the picturesque town and landscape is Hohenklingen Castle. Sitting high on a hill above Stein am Rhein, this fortress, which was built in 1225, is still the most prominent landmark of the city. 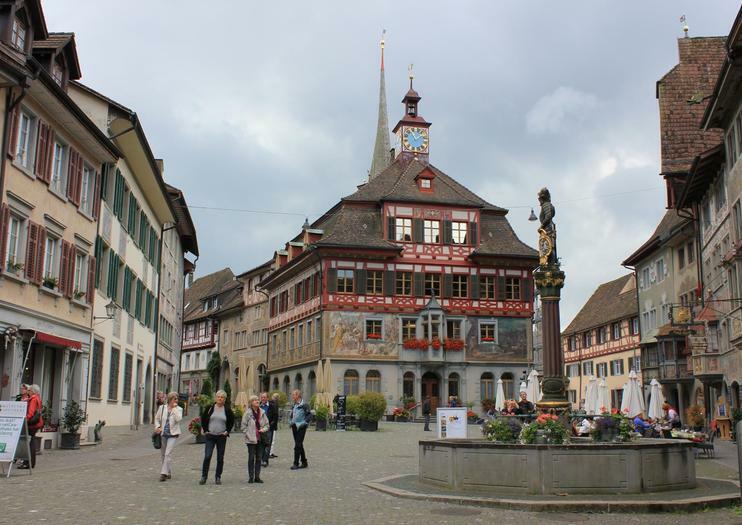 Stein am Rhein is located in the very north of Switzerland where Lake Constance empties into the Rhine River. It’s easiest to get to Stein am Rhein from Zürich via train. Take S-Bahn numbers S7, S8, S12, S16 or a regular train to Winterthur and there, switch trains to the S29 headed for Stein am Rhein.